Be the bold adventurer who puts all other crocodile hunters to shame. 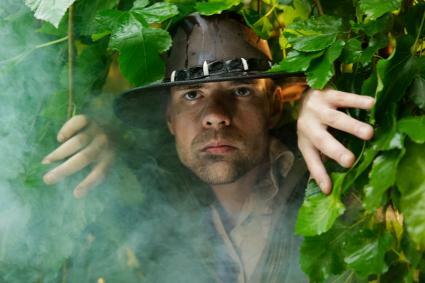 Dress up like a crocodile hunter and bag a stash of sweet Halloween treats to fuel your search for the Big Scaly One with these DIY and purchased costume options. First things first - the hat. The hat defines you, so take time to track down the right one. You want a bush hat with the crown encircled by a hatband studded with real or fake crocodile teeth, because they are trophies. A chin strap will keep it on throughout the most vigorous thrashing. You can transform an ordinary canvas safari-style boating hat (for men or women) or a child's cowboy hat into the crowning jewel of a croc hunter costume with a glue gun and some modest trim. Measure around the crown of the hat and add two inches for overlap. Cut a 1.5-inch wide grosgrain ribbon, that contrasts with the hat color, to your measurement. A brown ribbon against a khaki hat or an olive-drab ribbon against a brown hat provides enough contrast. Glue the ribbon around the crown where it meets the brim, overlapping the ends at the back of the hat. Let the glued ribbon bond to the hat and dry while you create cruelty-free croc choppers to decorate the hatband. Break off a hunk of polymer clay and knead it to soften and condition the clay. Pinch a piece of the worked clay and roll it between your palms to make a small cone, thinner at the tip and fatter at the opposite end. Two-inch teeth are fine for a 1.5-inch hatband. Press the teeth against a stone or cardboard flat work surface to slightly flatten one side. This will be the "back" that you glue to the hatband. Shape the teeth by curving them from mid-tooth to tip. Don't try to make them identical. Mildly irregular curving seems more authentic. Bake the teeth in a low-heat oven. Follow the manufacturer's directions for oven temperature and baking times. Remove the teeth from the oven and let them cool. Glue teeth around the hat brim with the skinny pointed tips up. Don't overdo it. One tooth about every two or three inches is fine and won't make the hat too heavy or cumbersome. Add an elastic hatband, purchased at your fabric trim shop, to the hat if it doesn't have a chin strap. Safety Tip: Keep polymer clay away from food prep materials. If the kids are helping to make the teeth, supervise closely so they don't nibble. It's non-toxic but not edible. And always ensure proper ventilation when baking the clay. Now you're ready to assemble the signature croc-catcher's clothes. Think khaki. It's a good color for hunter camouflage so you blend in with your surroundings. Khaki cloth - cotton twill or cotton duck - wears well and, happily, is quite common. Start early to gather your costume pieces and you should have no problem scaring up some suitable duds in a thrift store or an end-of-summer sale. You'll want a front-button, short-sleeve, collared khaki shirt with at least one patch pocket. If you can't find the right shirt, or you just want to add an extra layer, score a safari vest in khaki with pockets everywhere for storing all your gear. Pop it on over a plain, solid-color T-shirt and you're good. Add a bandana, folded in a triangle and tied loosely around your neck with the knot in the back. Khaki cargo shorts, the baggy kind with big, button-flap pleated pockets on the sides, add more authenticity. Protect your feet with dark brown - or any dull color - jungle boots or hiking boots and olive-drab or dark socks that just peep over the ankle-high sides. Toss in a pair of binoculars so you can see that croc coming before it spots you. The same basic style works for male, female, and pint-size stalkers of the genus Crocodylus, although it's more economical to use sneakers than leather boots for growing kids. Women who want to swap the safari pants or shorts for a khaki, olive, or camouflage skirt can definitely do so, and kids might find the costume warmer if they wear pants instead of shorts in cool weather. If making and putting together your own costume sounds too time-consuming, purchase a costume that fits the bill. Hit the Halloween parties in a slinky skin-tight "Me-Jane" costume with a khaki short-sleeve mini-dress featuring a lace-up, low-cut neckline, faux leather hip-slung belt and a straw safari-style hat. HalloweenCostumes.com has one for about $50 in sizes small through large. Bring your own binoculars and skip the leopard print accessories in favor of faux crocodile skin bracelets and wear hunting boots instead of stilettos for a more authentic look. If it's going to be chilly, leggings and a long-sleeved bodysuit in a neutral, light shade will keep you warm underneath. 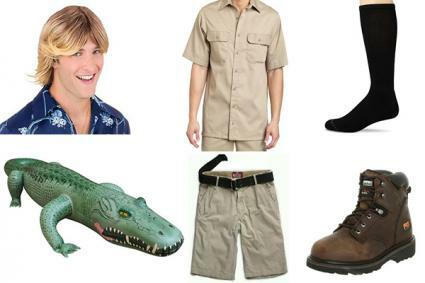 Carbon Costume makes it simple for you to find a Steve Irwin look-a-like costume online with links to score the khaki shirt ($25), brown workbooks ($70 to $124) and even a blonde, surfer-style wig ($14). Splurge on a real Aussie leather croc hunter's hat with genuine sharks' teeth in the band for about $110 or go faux and grab one on the cheap for about $12. Don't forget your pants! Men's cotton twill cargo shorts are about $15 to $30, depending on size. Junior or the Princess may want to wrestle with the big scaly monsters for Halloween thrills but you'll have to re-purpose an old Scout uniform or bite the bullet and shop for pint-size khaki safari clothes to create the look. 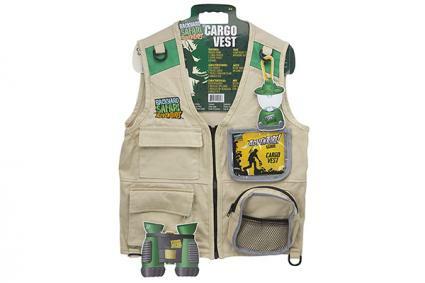 Make it easy on yourself with a Backyard Safari Cargo Vest for $16 from Amazon - includes a khaki cargo-pocket twill vest, D-rings for hanging gear and a mesh zipper pocket roomy enough for some plastic field binoculars. Gotta have a hat, so pick up a child's cotton outback hat for less than $8 and you'll be set once you add pants. Don't Forget the Captured Croc! The whole family can muck around in croc hunter gear in homage to the great Irwin or in preparation for your next outback adventure. But kitting out the tiniest members of the team is more challenging. So turn the toddler into a crocodile for trick-or-treating with a velour croc costume for just over $30 from ToysRUs that slips over tights and a sweater or long-sleeved shirt. When all the excitement exhausts your fierce, big-snouted baby, you can toss him over your shoulder like the catch of the day without even breaking character. A candy-gathering expedition in crocodile hunter garb, or attending a costume party as your favorite hunter from down under, shouldn't break the bank. Real hiking boots and bush hats work just as well for summer or winter nature adventuring as they do for a costume. Cargo shorts are great beach and boat shorts, and a safari vest could be handy for stashing stuff so you're hands-free on vacation. Careful children can be trusted with working binoculars slung around the neck on a sturdy cord. And you can always trade that baby croc costume to someone else in the playgroup who may have the perfect Pikachu or Tinkerbell costume for your preschooler next year.